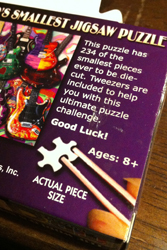 The other day, Mom and I were looking around a Hallmark store when a display caught my eye for the “World’s Smallest Jigsaw Puzzle” – small puzzles, when completed only 4″ x 6″, with tiny pieces – so tiny, in fact, that they include tweezers to help you piece the puzzle together. I’ve loved miniatures since I was a little kid, and I totally wanted to do one of these. 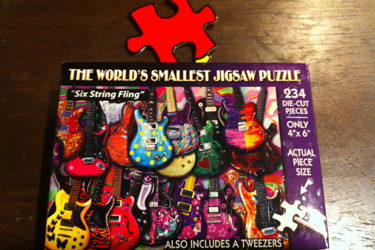 When Mom saw me looking at these puzzles, she told me, “I have one at home!” AWESOME. I’d never actually completed a full jigsaw puzzle before, except for those ones for kids that only have like, 20 pieces. I think being the youngest child, no “real” jigsaw puzzles survived to be handed down to me, and I’d never before really been all that interested in jigsaw puzzles. Tonight, I took on the tiny, tedious, totally fun challenge. I started out by finding all the “edge” pieces, and just that took me between ten and twenty minutes, and then the real work began. Nick and I set up a camera so we could take some time lapse shots. Here’s the video of my progression! From start to finish, this puzzle took me about three hours to complete. It was fun, and the pieces were so cute. One of the things that surprised me was how helpful the tweezers really were. 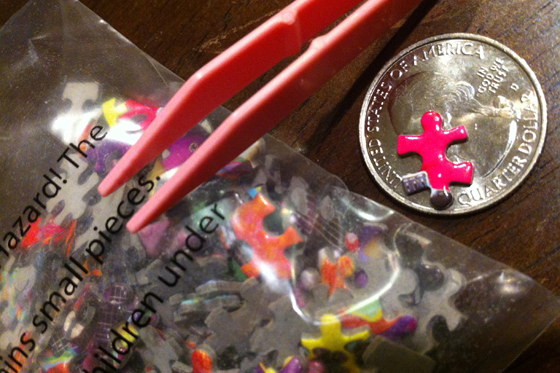 I thought I didn’t need them, but they totally made it easier to grab the pieces at times. Another thing that I really appreciated about this, is that if you have patience, and you learn to look at things in a different perspective, it’s really fun to see things come together and make sense, after starting from what’s originally a big jumble of confusion. I really enjoyed this. While I’m not totally into huge puzzles since they take so long, this size puzzle is doable in an evening, and for some reason, I really did like the fact that the pieces were so small too – it doesn’t take up that much room on your table, and doesn’t take that long to finish – so you don’t even need a puzzle mat!